The Magliner Snack Truck is the most popular route delivery device for people who deliver light items, such as chips, pretzels and the like. Starting price of only $252.99 for the basic configuration, extra charges for upgrades and optional accessories. Choose from multiple handles, nose plates and extensions, and wheels. Click here for Magliner Replacement Parts. 5. Add extra optional accessories. Please note, not all parts are compatible and you will see references to that effect as you scroll down the page. At the same time the system is set up to disallow a combination of non-compatible parts, so you may shop in confidence! Just check off your choices as you scroll down the page! Cast magnesium sliders with replaceable low friction polymer skid bars. Tough and quiet. Frame extensions are only compatible with handles # 11 and 12 in Step 2. 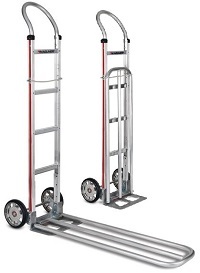 Brings the height of the hand truck to 65.5" for taller loads. Brings the height of the hand truck to 68.5" for taller loads. Brings the height of the hand truck to 73.5" for taller loads. 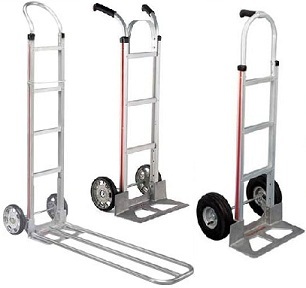 Brings the height of the hand truck to 75.5 " for taller loads. 13" long x 8" wide. Perfect for hand held computers . 16 1/2" long x 12" wide. Perfect for the vending industry. 18" long x 12" wide. Perfect for food service splits. 29" long x 12" wide. Perfect for cleaning supplies. Includes 2 Strips, They Will Go On The Front and Back of 2nd Cross-Bar. 32 characters maximum. Enter your company name below. We are very pleased with our hand truck. Ordering was easy, the product shipped in a reasonable time, was easy to assemble, and works great. High quality product that shipped within three days of order. Very happy with design. Advantages: You can build the hand truck to your specific needs. Disadvantages: The only disadvantage is you have to do some assembly. Nice and easy put together, its the best hand truck ever.